Weathercatch: Is our early snow an indicator of another rough winter? Three remarkable calendar events unfolded this past weekend — the season’s first snow, a Hunter’s Moon and the end of daylight saving time. PULLMAN, Wash. – Damage caused by snow mold in some eastern Washington wheat fields has surprised a Washington State University plant expert who has studied the fungus for nearly four decades. 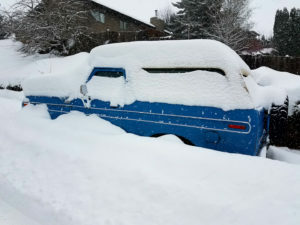 SPOKANE, Wash. – If there’s one thing this winter has demonstrated, it’s that the weather can still turn very cold and snowy in our region. PULLMAN, Wash. – The frigid temperatures, blowing and drifting snow responsible for school delays and road closures in the eastern half of Washington state “is like something you’d see in the Dakotas – not here,” said meteorologist Nic Loyd of Washington State University’s AgWeatherNet. PULLMAN, Wash. – Photos of the first significant snowfall of the season were taken Tuesday morning at Washington State University Pullman by Dean Hare, WSU Photo Services. DAVENPORT, Wash. – Along a blustery rural highway, foresters from Washington State University and the U.S. Department of Agriculture are proving that living snow fences – windbreaks made of live trees – can protect Northwest roads and farms from winter’s fury. PULLMAN, Wash. – Snow brought beauty and slow, treacherous travel to Washington State University Wednesday. More snow and freezing rain are forecast for the Pullman area from noon Thursday through Friday night, according to the National Weather Service in Spokane, Wash.
Our chance of a white Christmas – On Dasher! SPOKANE, Wash. – Dreaming of a white Christmas? With only a week to go, whether the Inland Northwest still will have snow on the ground is literally up in the air. Ask Dr. Universe: How does snow form? 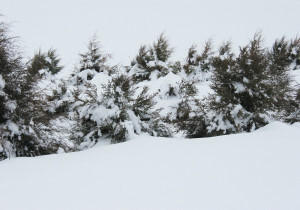 PULLMAN, Wash. – It just so happens that when I looked out the window, everything was covered in glittering snow. I watched it fall from the sky and wondered how exactly it formed, too.